Looking for a beach treasure hunt? Turn your beach combing into a real search for the beach treasure of glass floats. These floats are like the ancient mariner net weights used by fishermen. Dozens of new floats are added to our beaches weekly. 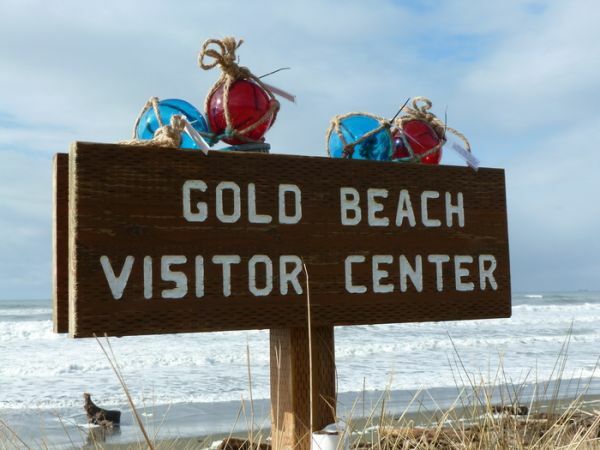 February through April is Beach Treasure Hunt season in Gold Beach. Find a tagged glass float on our beach. Bring it to the Visitor Center to see if you’ve won a prize. There are weekly and monthly prizes. First, make sure you search for the glass floats in the right location. They’re above the high surf line in the driftwood and beach grass. Also, you will only find them from the Rogue River jetty to south of Kissing Rock. That’s almost 3 miles of treasure hunting on our awesome beaches! In addition to beach hunting, you can shop for your treasure at select Gold Beach stores. Ask the Visitor Center staff for a list of the Treasure Hunt Stores. Between trips of hunting for treasure on the beach you can hunt for hidden treasure in our shops. Shop at one of the stores on the Beach Treasure Hunt map. If you spend at least $25 between February 1 and April 30 bring your receipt to the Visitor Center for your own glass float Beach Treasure. Red floats are the beach treasure for the week of Valentines Day. During Saint Patrick’s Day week green beach treasures appear. Have fun but just take one!